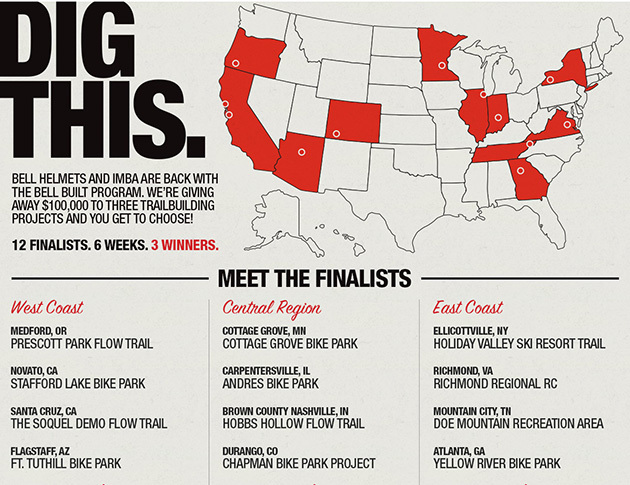 Bell Bike Helmets and the International Mountain Bicycling Association (IMBA) have announced the 12 finalists for the 2014 Bell Built Grants: $100,000 in technical assistance money put up by Bell for three bike projects to be built in 2014 by IMBA Trail Solutions. Public voting to choose the winners began April 7 and ends May 18, with winners announced May 19. The project that receives the most votes from each of the three areas above will win one of the three Bell Built grants. Any combination of trail types (pump track/bike park, flow trail, DH/gravity trail) may receive the grants.